Not accounting for standalone characters, decorations, or non-playable characters; you would have to spend close to 3,000 donuts to add all of the premium buildings to your town. It is worth mentioning that some of these premium buildings could have been obtained through holiday events such as the Whacking Day event from the spring, or from the Christmas event last winter. Once you subtract the buildings you may have earned for free from that number, you’re down to only have to spend a little over 2,000 donuts to acquire all of the premium buildings. So if you did buy the “Boatload of 2400 Donuts” you would have a few donuts left over to spend on the remaining premium content. For the most part, NPCs are completely useless. All they do is perform an animation, and perhaps provide some voice-clips. Other than that all these characters do is walk around and make your town seem more active. They don’t add any bonuses to your conformity meter, and you can’t send them on any tasks. If you wanted to add all of these NPCs to your town it’ll cost you around 800 donuts. Some of these NPCs were made available for free during holiday events, so if you secured them at that time it would only cost you around 500 dounts to add them all to your town. Still though, that’s a lot to spend on content that adds so little to the game. If you’re the type of player who needs to buy something while you still can, because you know it won’t be available again, EA sure has your number. The grand total for limited-time content comes to over 2,000 donuts. Since all of this content was spaced out over the course of a year, you’re much more likely to spend between $9.99 and $19.99 picking up this content. If you want to add all (or most) of this premium content to your game, don’t save-up donuts, save up your money first. The “Boatload of 2400 Donuts” does cost $99.99, but that is going to be a hell of a lot cheaper in the long run when you take into account how much premium content there actually is in the game. To get everything listed above you’re going to need to spend between five and six-thousand donuts. This doesn’t even take into account premium decorations that are always available to purchase. You can get a majority of the premium content, for about $300 if you’re smart about which donut package you buy. If you’re a compulsive buyer and only get between 132 and 12 donuts at a time, then you could be spending up to $1,200 on content in this game. Of course, it’s more likely to fall closer to $600 if you get your tend to buy your donuts in packages of 300 or lower. I think all of it is worth the donuts, well maybe not the funzos. I chose to buy everything I could and am enjoying the game to it’s fullest. I have a set budget for entertainment each month and if I want to buy donuts, I just take that amount out of my budget. If I didn’t really spend donuts, I would read through the reviews on each premium piece and make a judgement call based on that. I’ll buy a boatload every few months, I don’t feel like I’ve spent more than necessary. What do you feel is overspending? Boatloads are okay, it was just the price per donut thing I was worried about. Nearly everything is listed in this post to make it easier to choose. Do you care more about earning money and XP, or just something you’ll enjoy? What do you have already? I recommend a character who is voiced, and is someone you like from the show. To be honest the only premium item I have is the squeaky voice teen which I won from a weekly mystery box. How far along are you into the game? 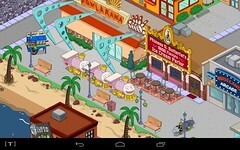 I think it might be worth it to pick-up Moleman and Kearney for Krustyland jobs. The Open Air Stage is pretty nice. It’s fairly unique and has some nice task options for characters. I have a little over 215 donuts and I have no idea what I should spend them on which I’ve obtained through Golden Scratchrs paying about 15 dollars for.Can someone please help me know what to do with them.